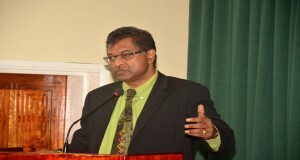 With mounting concerns from local promoters and party-goers over the 2:00AM Party done curfew, Public Security Minister Khemraj Ramjattan says that the curfew will be lifted for some of the events as Guyana celebrates 50 years as an Independent nation. Ramjattan made the disclosure when questioned on the issue by Demerara Waves on Monday afternoon. The Security Minister stated that while the curfew is not being lifted completely, it will be relaxed for some events. Interested promoters will have to apply to the Minister for a waiver for their events. “We are going about it on a one on one basis not exclusively for the entire thing. You have to have a justification for certain events and I will utilize my discretion for that,” said Ramjattan. He said that already numerous requests have been received by his office to relax the curfew. Ramjattan said that while the move is discriminatory it is violating hence it will be done with the strictest approach possible. “Look, they got some of them trying to capitalize in an unjustified way…because they brought in some Jamaican DJs. We ain’t got DJs in Guyana? Because of the DJ coming in from Jamaica they said they want to go till 5 in the morning…well I am not going to allow that,” said the Security Minister.